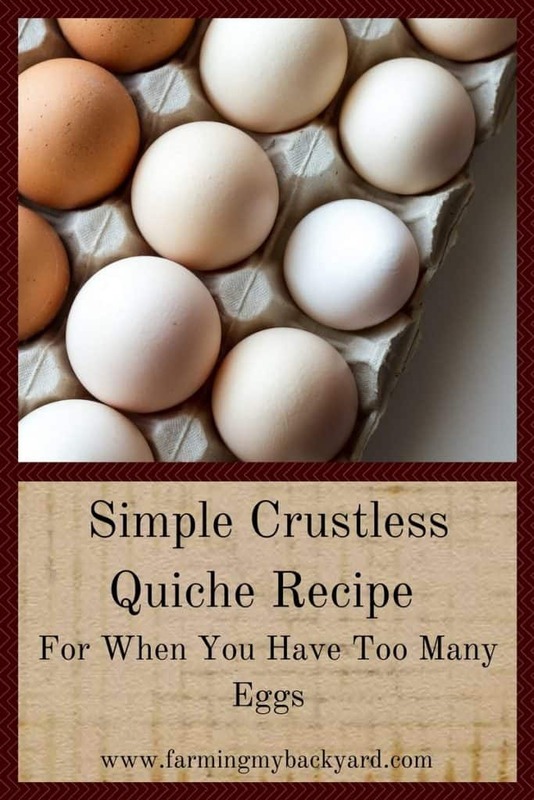 When you have too many eggs it’s time for quiche! It’s a perfect spring time dinner that can be made almost completely with ingredients from our backyard farm (I’ve yet to successfully make cheese). I love cheese quiche, but I hate making pie crusts and I’m too cheap to buy a premade one. Thankfully our cast iron pan is perfect for a cheesy crustless quiche. The nice thing about this recipe is that you can make it almost entirely from foods that you grow yourself. If you are into cheese making and your goats produce enough milk, then you could have an entirely home grown dinner! It’s also nice to have a quick and easy recipe that can blast through a bunch of eggs just in case you can’t quite keep up with your hens. I prefer spinach in this, but you could use any green that you happened to have fresh in the garden. Some good choices might be chard, kale, or broccoli! What is your favorite way to use up extra eggs from your hens? Share in the comments! This was so good! I did add one cup of green onions. Oh green onions would be yummy! I made mine in a ten inch cast iron pan. It would also work in a 9×9 glass baking pan without having to adjust cooking time. If you use a larger pan keep an eye on it so it doesn’t over cook. Chiffon cakes will also use up a lot of eggs and in a most delightful way.